If you really want to help your bones go the long-haul you'll want to read closely. When I first cracked open the Nourishing Broth book, I read something that was very upsetting! For years now I've added a splash of ACV to the pot, along with the bones, filtered water and veggie scraps, in order to draw more minerals into the broth, and now I find out it's not a significant source of minerals after all?! That's why I add extra collagen in my cooking every chance I get. Since collagen is so beneficial for so us, not just to help your bones but in many other ways, and because I never know for sure if I'm using the right bones or simmering them long enough, etc., I like to just slip in a scoop of this grass-fed collagen to my broth, soups, stews, sauces, smoothies, etc., as I explained in this superfoods post. Why diabetics need to pay special attention to this information! One more thing you need to know: Watch out for broth made with bones from conventional animals! One molecule we can predict to be severely affected by glyphosate substitution for glycine is collagen, the most abundant protein in the body. Collagen is essential for cushioning the joints, and, when it is defective due to glyphosate contamination, it performs poorly in its job, leading to joint pain and tendonitis, among other things. This can explain why so many people today suffer from chronic pain conditions such as shoulder pain and back pain, and why we have an epidemic in opioid drug abuse. Foods that contain high amounts of gelatin can be expected to be highly contaminated with glyphosate, and this includes bone broth, which would ordinarily be very nutritious. One also has to consider the implications of glyphosate contamination in gel capsules. You can help reduce glyphosate exposure for your family by switching to a 100 percent certified organic diet. More generally, there is an urgent need for government action to ban glyphosate in order to protect our population from harm. Source: Stephanie Seneff's article: Glyphosate in Collagen. Gelatin is also the main constituent of gel caps, which have become a standard way of packaging both pharmaceutical drugs and nutritional supplements such as fish oil. I would predict that any nutritional supplement housed in a gel capsule is going to cause you much more harm than good, because whatever benefit the contents provides is more than offset by the damaging effects of the glyphosate. This also means, of course, that bone broth, a highly nutritious food, must be made from grass-fed beef rather than from the large confined animal feeding operations (CAFOs). One solution is to be sure that your supplements use vegan gel caps, which are made from cellulose, a plant-derived polysaccharide that would probably be much less at risk of glyphosate contamination. Perfect Supplements assured me that they do not use gelatin caps in any of their Perfect Supplement products. All are either cellulose, pullulan, or carrageenan. I also confirmed that the probiotics and K2 caps that I recommend are made from cellulose. Hydrolyzed Collagen – prefer your collagen bathed rather than cooked? Hydrolyzed Collagen is simply collagen that is bathed in enzymes, which breaks the protein down into smaller pieces, giving it a lower molecular weight and making it easier for the body to absorb and digest. Hydrolyzed Collagen has the highest bioavailability of any form of collagen. Collagen Hydrolysate – the exact same thing as Hydrolyzed Collagen…because scientist like words that begin with hydro??? NOTE: Now I keep this broth that you can order online and is shelf-stable in my pantry for the days that I'm too crunched for time to even deal with my frozen broth from the freezer. They make it just like I do and it tastes great too! 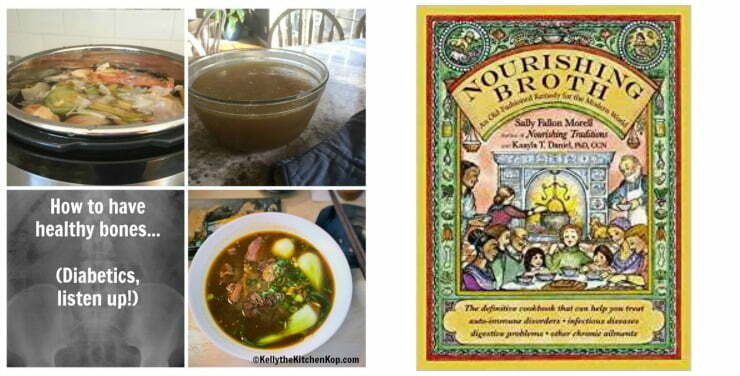 Read my post about the Nourishing Broth book here: What's wrong with my broth?! 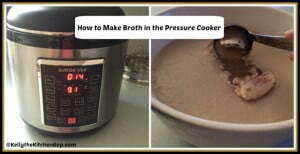 What to do if your stock won't gel and should you boil or simmer broth? You mention carrageenan above as okay. I thought this is of concern as well. https://www.drweil.com/diet-nutrition/food-safety/is-carrageenan-safe/ There are other articles as well. Does the hydrolyzed collagen negatively affect those sensitive to MSG and excitotoxins in general? I have been told never to ingest anything hydrolyzed. I would like to take collagen though. I asked Perfect Supplements and here’s what Dan said, “If she has been told to not have anything Hydrolyzed, then she should avoid Hydrolyzed Collagen. In that case, maybe recommend our Perfect Bovine Gelatin which is not hydrolyzed. MSG (Monosodium Glutamate) is the sodium salt of glutamic acid. Glutamic acid is a non-essential amino acid and found in numerous foods. Fun fact to throw out at your next dinner party – we all have about 4.4 pounds of Glutamic Acid in our body. MSG is produced outside the body and often in a synthetic environment. Chemical formula C5H8NNaO4. Glutamic Acid has a chemical formula of C5H9NO4. So, not exactly the same thing. The problem with MSG is it is manufactured to have very high levels of Glutamic Acid salt. MSG – highly concentrated and at times synthetically processed – is certainly troubling. We totally agree that the chemical process used to make MSG is troublesome and we would NEVER add MSG to our product. Our hydrolyzed collagen is 100% natural, and like many other proteins, it contains glutamic acid. Again, this is NOT the same as MSG (the Whole Foods article explains it clearly). I also want to point out that even if you have Gelatin or Collagen that is not hydrolyzed – it will be hydrolyzed by the acids in your stomach. This is just the natural process of breaking down protein. We want to be completely transparent, here is our full lab testing showing the amount of Glutamic Acid – https://www.perfect-supplements.com/pdfs/CollagenTestResults.pdf If anyone has a sensitivity to Glutamic Acid and is looking to limit it in their diet, they may use this information to make that determination. I just want to be clear that a naturally hydrolyzed protein (which our Collagen is) is not the same as MSG. If anyone has additional questions – feel free to contact us and we would be happy to discuss further. Things that other people are fine with can cause severe symptoms for us. Wow Kelly, that was a packed article that took a lot of time to write. I have had this book for a year+. I have not picked it back up since the first week. We are off on a vacation, I think it is making its way into my bag for some reading! Thank you. Thank you, Kelly for the information and explanations! 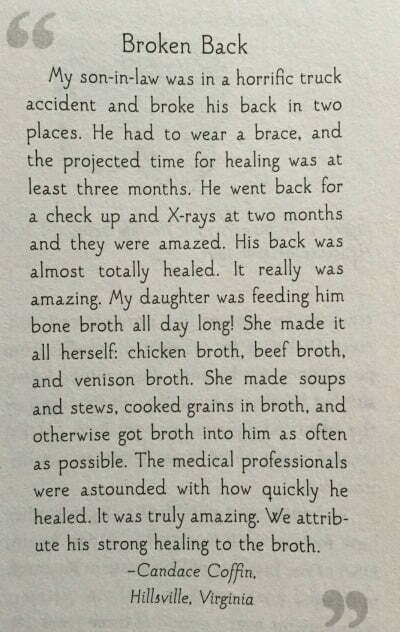 I wish I had pushed my bone broth on my son every day after he broke a bone in his hand. I do have a question. When I make homemade bone broth, I dutifully add the apple cider vinegar. After refrigeration, my broth does not gel. Before learning to add the ACV, it would always gel. I’m thinking about forgetting the ACV for the sake of getting the gelatinous texture I want. Should I use ACV all the time anyway? Thank you for your reply. I follow the same recipe for my chicken stock that was printed in the article and I usually add 4 chicken feet which I am able to get from a local Amish market. Usually the bones I use come from chicken parts also purchased at the Amish market. Sometimes I have organic chicken from the grocery store (Nature’s Promise) and sometimes Bell & Evans brand, although not always organic. I think I’m going to try a bit of trial and error with my next few batches and keep track of my ingredients and results. 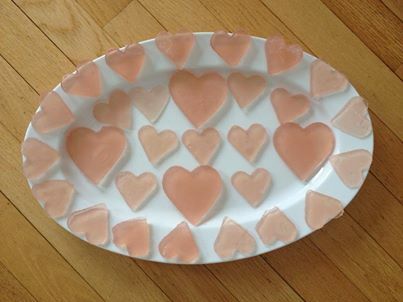 I will say, however, that I believe the stock I make is great for soothing the gut (even when I see no gelatin). It has become my first post-migraine food instead of a hard-boiled egg. I make soup for my husband every time he returns from business travel to help his gut. I’m planning to make stock today! Important information here, great work. Thank you Kelly! 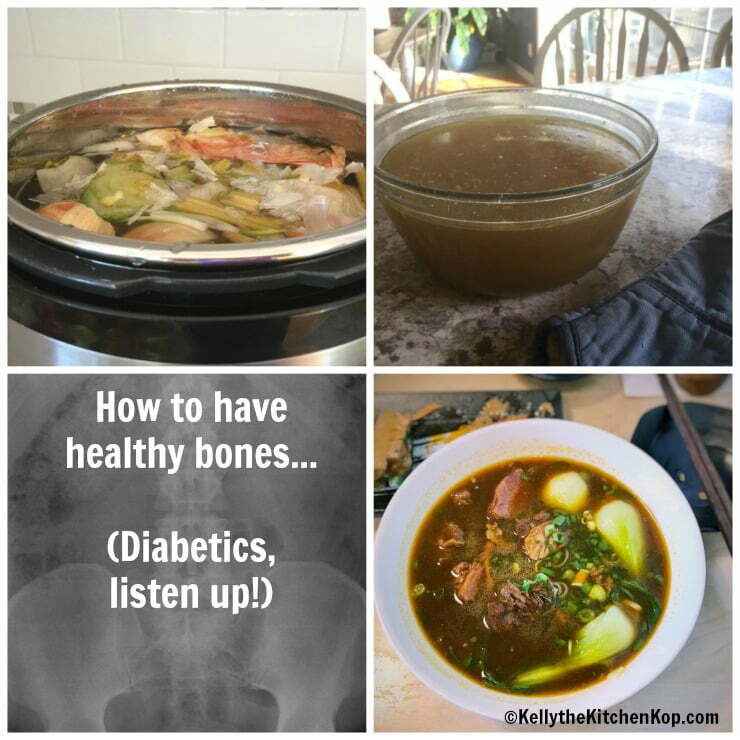 Kelly, Thanks for including my comment from “Nourishing Broths.” I am now 67 and continue to have excellent bone density despite having been diagnosed with Chronic Fatigue Syndrome at 58 and being able to do only an hour of Pilates a week plus walking for 20 to 30 minutes a few times a week. The technician who does my bone scans calls me “The Poster Child for Healthy Bones.” Keep up the good work telling people about bone broth. 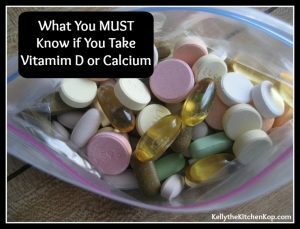 Calcium is not the answer; the combination of minerals in the bones is!